And for Peter Parker, this truism, however phrased, reveals his ongoing battle with the responsibility inherent in his acquiring super powers, complicated by that occurring without his choice. The world of Peter Parker/Spider-Man has been manipulated in the Marvel Universe (even literally) as an internal battle between that responsibility and Parker’s own personal desires (personified often as love interests such as Gwen Stacey and Mary Jane Watson). In the real world, I believe, “With great power comes great responsibility” informs us in important ways, including a recurring concern about police using deadly force against young African American males, domestic violence, and the role of teachers in our classrooms. As I have highlighted recently about the teacher Mrs. Price in Sandra Cisneros’s “Eleven”—“Because she’s older and the teacher, she’s right and I’m not”—the teacher/student relationship often hinges on whether the teacher embraces an authoritarian (Mrs. Price) or authoritative stance (see Freire). Whether a person’s authority is a status (teacher, police) or a consequence of an imbalance of power (physical advantage, for example, men often have over women), authority (“great power”) carries with it “great responsibility.” Too often, however, those with that authority appear to forget or misunderstand what that responsibility is, resulting in a abuse of authority. The authoritarian pose—might makes right—always fails people with authority but also those subjected to that authority: students, citizens, spouses, children. Instead, the authoritative pose better serves the “great responsibility” of authority. A first requirement of the authoritative pose is humility, embracing ones authority with the skepticism that the authority isn’t deserved, that especially those under that authority may merit the authority as much or more than anyone who holds it. That stance of humility allows those with authority to honor the dignity of those under that authority more than retaining the authority itself. Whether the authority is a police officer (legal authority), a teacher (bureaucratic authority), or a husband (physical-dominance as authority), breeches of the responsibility of authority can often be traced to the person in authority seeking ways to prove that authority in order to retain the status. The consequence of this, of course, is sacrificing those subject to the authority, the ultimate abuse of authority (a police office shooting an unarmed person, a teacher crushing a student’s spirits, a husband hitting his wife). A second requirement of the authoritative pose is seeking authority from authentic sources beyond status. While police and teachers, for example, cannot eradicate the status authority they hold, they can behave in ways that earn their credibility independent of their status. Police must not be above the law, for example, but must embody justice; teachers must not abdicate their content and teaching knowledge, but must model the highest qualities of teaching and learning for their students. Here, physical authority represents a slightly different context in that having physical power gains credibility by the commitment never to use that physical dominance. Men must not hit women, and adults must not hit children. Such promises garner the highest levels of credibility, respect, and thus, authority. The authoritative pose, then, is earned—whether in the context of authority status or not—and ultimately, the authoritative pose gains authority from honoring that “great responsibility” that lies in the dignity and safety of those under that authority. The authoritarian pose remains a failure of both “great power” and “great responsibility.” We remain faced with too many examples of that failure, some subtle, some catastrophic. 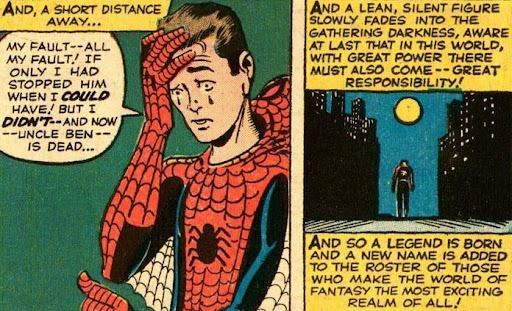 While Peter Parker’s struggles with his superhero status remains enduring and compelling theater, the authoritarian pose remains a real-world tragedy we could do without. I want to pose a couple of situations that may appear authoritarian, but are they? A student disrupts the learning environment in the classroom—by making noise or having a conversation. The teacher asks the student to stop that behavior. The student says he isn’t doing anything and continues the same loud, disruptive behavior, he was doing before. The teacher repeats himself. The student protests that he is doing nothing, and he is innocent implying the teacher is wrong. The lesson has now all but stopped. Learning is not taking place. The teacher writes a referral and suspends the child to the office to see a councilor or administrator. The student protests loudly and in anger—he may even accuse the teacher of racism because the student is a minority and the teacher is white— and then the student storms loudly out of the classroom with a great display of anger. The same scene could be repeated with a student chewing gum and there is a reasonable district and school site rule that chewing gum in the classroom is not acceptable—because walkways and classroom carpets are blemished with a blizzard of dried and flattened globs of gum. The teacher asks the student to get rid of the gum. The student says she doesn’t have any gum in her mouth, but she is chewing with her mouth open and the teacher isn’t blind. This episode ends simliar to the first example. When you say authoritarian, I think are are referring to schools that go out of their way to program the students and crush problem solving and creative critical thinking skills where a student might disagree with the generally accepted political correctness of the meaning of a work of fiction or nonfiction, but one or more students sees that it may mean something else. In a classroom environment where the teacher is not an authoritarian teacher, instead of censuring that student, the teacher allows that opinion to be expressed and become part of the class conversation linked to the lesson.